Hylomonus (above) is the oldest-known reptile, and was about 8 to 12 inches (20 to 30 cm) long. Westlothiana has been suggested as the oldest reptile, but is for the moment considered to be more related to amphibians than amniotes. Petrolacosaurus and Mesosaurus are other examples. 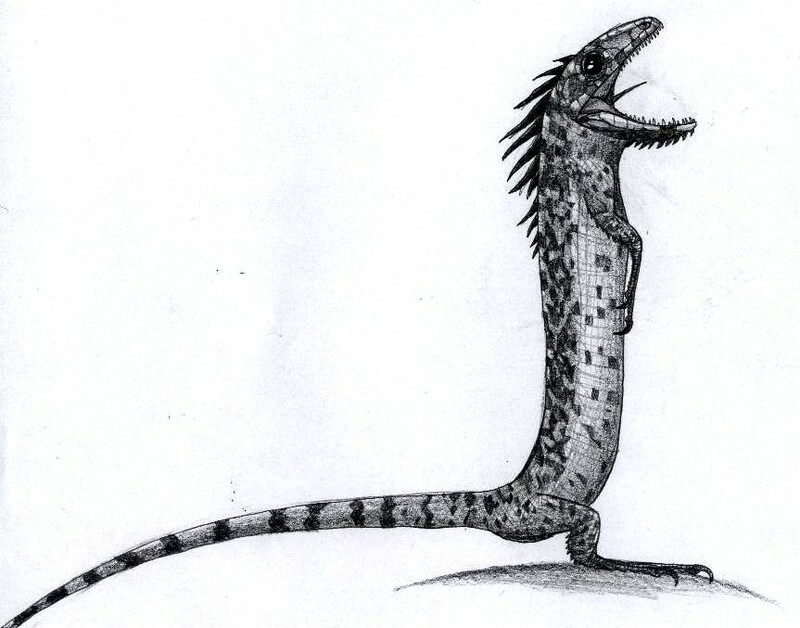 The earliest reptiles were found in the swamp forests of the Carboniferous, but were largely overshadowed by bigger labyrinthodont amphibians such as Proterogynrius. It was only after the small ice age at the end of the Carboniferous that the reptiles grew to big sizes, producing species such as Edaphosaurus and Dimetrodon. The first true “reptiles” (Sauropsids) are categorized as Anapsids, having a solid skull with holes only for nose, eyes, spinal cord, etc. Turtles are believed by some to be surviving Anapsids, as they also share this skull structure; but this point has become contentious lately, with some arguing that turtles reverted to this primitive state in order to improve their armor. Both sides have strong evidence, and the conflict has yet to be resolved. Shortly after the first reptiles, two branches split off, one leading to the Anapsids, which did not develop holes in their skulls. The other group, Diapsida, possessed a pair of holes in their skulls behind the eyes, along with a second pair located higher on the skull. The Diapsida split yet again into two lineages, the lepidosaurs (which contain modern snakes, lizards and tuataras, as well as, debatably, the extinct sea reptiles of the Mesozoic) and the archosaurs (today represented by only crocodilians and birds, but also containing pterosaurs and dinosaurs).